This 370-meters long and 20 meters wide outdoors pedestrian street, lined by a total of 12 buildings, serves up and upscale shopping, dining and hangout experience. The buildings themselves are primarily offices and apartments but there are retail and restaurant units at the ground floor and rooftop levels. It's the place to go to after you've finished your touring for the day and just want a nice place to unwind in the evening. Apart from the fact that the experience feels high-end there is really nothing much a unique to this place. It is a swanky mall. For most people their favorite activity here is people watching. Also, the views at night from the restaurants on the top floors it's quite nice. Sometimes there's a live musical performance. There is lots of parking space. 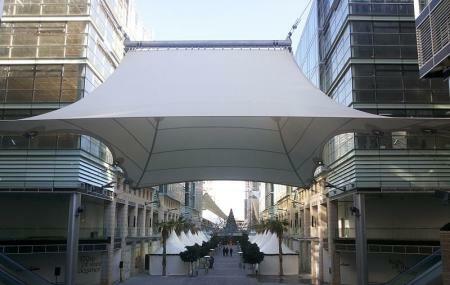 How popular is Abdali Boulevard? People normally club together City Mall and Darat Al Funun while planning their visit to Abdali Boulevard.